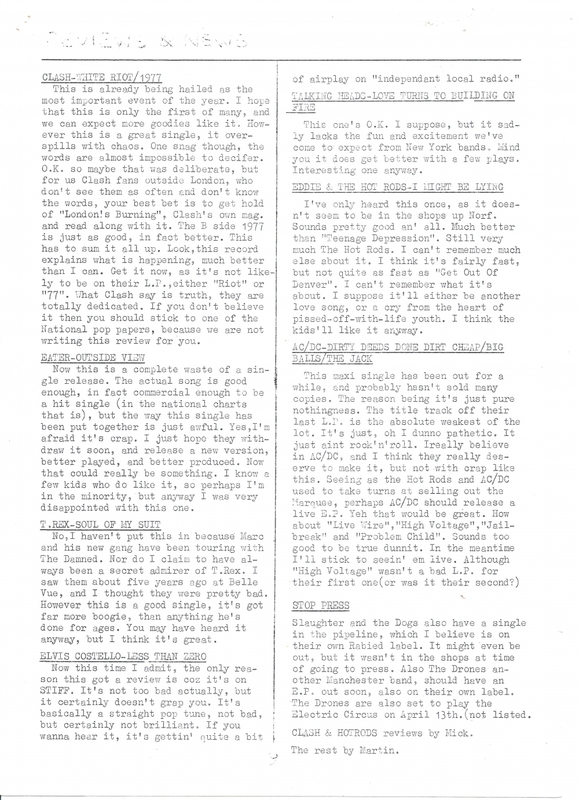 Page 9 of punk fanzine Ghast Up with a round up of current singles. Rather lukewarm appraisal of both Costello and Talking Heads' debut singles, although many of the reviews were done from having heard the singles either at gigs or on the radio. An interesting note here, the info about Slaughter and the Dogs forthcoming single was supplied during my first ever encounter with Rob Gretton, who announced the news whilst DJing at The Oaks. Despite Rob's less than cooperative reputation of later years, he very helpfully answered my request for the details of the Slaughter single and proceeded to give me the titles of both sides, the label and likely release date and a clipped assessment of both tracks being great.